Each island can also be connected horizontally or vertically to an adjacent island by a bridge. The adjacent island can be any distance, as long as it is directly along a compass direction. 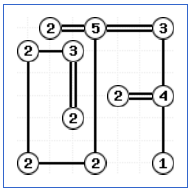 The aim of the game is to draw bridges such that every island has a number of bridges connected to it equal to the number written on it. Additionally, every island must be reachable from every other island by the network of bridges. The ultimate aim of the program will be to have a Bridges solver, which can take any board and solve it by applying some algorithms and using a tree search where it can't work out a certain next move. But what I'm including for this review is just the core module, which defines the relevant types and provides the basic functions needed to interact with the game. | _ -> failwith "Between must be used for a horizontal or vertical line"
if CanAddBridges board connection 1 |> not then failwith "Tried to add invalid bridge"
As I said, I'm just starting out, so a lot of what I'm looking for is basic code-style stuff. That's with a particular focus on writing idiomatic F# code, but at the same time I'm aware that it's possible that I'm over-compensating and- for example- putting functions at the module level that really should be members on a type. I'm also interested in any advice relating to encapsulation. This design is the best way I could come up with for this particular problem, after some false starts, but I'd be happy to hear high-level alternatives. Let's explore what this would look like with an adjacency-list representation of the graph. Apologies for any errors I introduce along the way. One motivating factor is that a lot of operations that we do are local, not global -- we're often just interested in the neighbours of a particular island. There are other possible choices for Map<Island, int>, but let's stick with this for now. At this point we can remove IslandConnections altogether. Next up is ConnectedTo. Here's a good example of us being interested in local operations -- we can remove the board parameter. The remaining functions don't look as nice as I would like them to. I'll post them here for completeness, but there are (hopefully!) cleaner ways to express them. if CanAddBridges board islandA islandB 1 |> not then failwith "Tried to add invalid bridge"
This sounds way too general to me. Unless this code is in a namespace that you're not showing here, you should use a more descriptive name. I don't like that you have undirected graph, but you're calling the edges Origin and Destination, as if the edge was directed. Though I'm not sure what would be a better solution: tuples are also ordered and creating a custom "unordered pair" type just for this is an overkill. I don't think this can work. Vertical line is not just a line that has both X coordinates zero, it's a line that has both X coordinates the same. else failwith "Between must be used for a horizontal or vertical line"
I think think makes the structure more obvious, but it's also more complicated, so it's probably the worse option. Not the answer you're looking for? Browse other questions tagged functional-programming f# graph or ask your own question. How can I make this F# more functional? is there a more functionally idiomatic way of generating valid dates in f#? Future in f# is this an unavoidable use of a mutable variable?